The findings show that graduating into a recession has had a clear impact on the career trajectories of the Futuretrack cohort. Compared to the Class of ’99 graduate cohort study undertaken ten years earlier, a much higher proportion of graduates are working in non-graduate jobs. However, although graduate earnings relative to average earnings are falling, the graduate earnings premium is positive and significant. Applicants who did not go on to graduate from HE have, on average, more labour market experience than those who graduated, but their earnings are significantly lower. Although higher education can play an important role in offsetting inequality, the continuing impact of social class and gender is clear. Graduates whose parents held professional and higher managerial jobs are more likely to have attended prestigious universities, to have studied subjects likely to lead to better paid jobs and to are less likely to accumulate large personal debts while studying. Patterns of subject choices remain gendered, but even when comparing graduates from the same discipline, a gender pay gap exists. 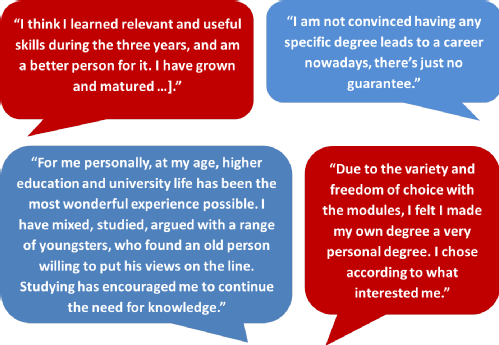 Despite these mixed findings, the Futuretrack cohort remained positive about their HE experience and future prospects. Two thirds of graduates were optimistic about their long term career, and 96% of graduates said that with hindsight, they would still go into HE again.